Periodic backup of the Avi Vantage configuration database is recommended. This database defines all clouds, all virtual services, all users, and so on. Any user capable of logging into the admin tenant is authorized to perform a backup of the entire configuration, i.e., of all tenants. A restore operation spans all the same entities, but can only be performed by the administrator(s) capable of logging into one of the Controllers using SSH or SCP. It is a best practice to store backups in a safe, external location, in the unlikely event that a disaster destroys the entire Avi Controller (or cluster), with no possibility of remediation. 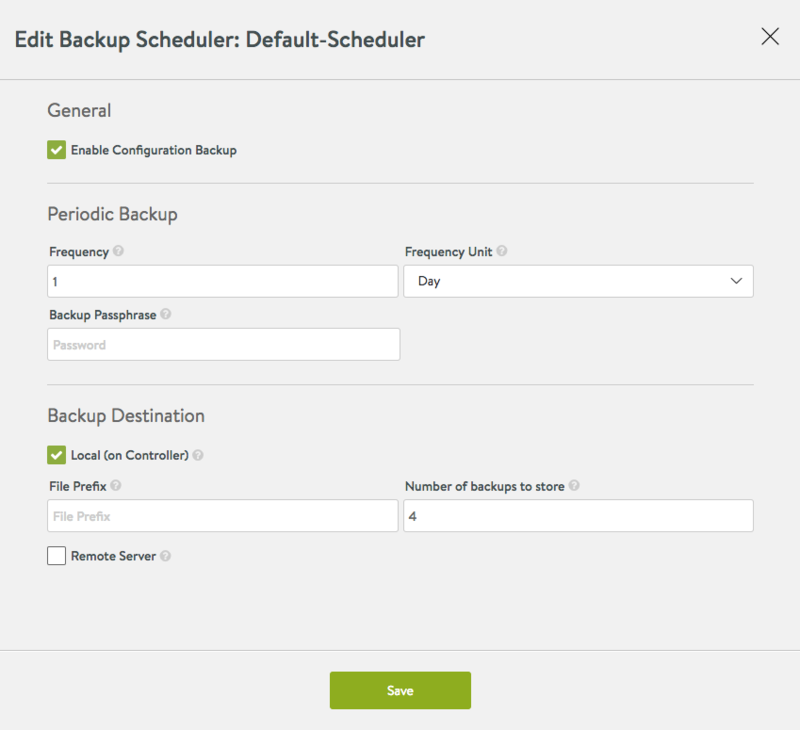 Based on how often the configuration changes, a recommended backup schedule could be daily or even hourly. To back up the Avi Vantage configuration, use the UI, CLI commands or API commands shown in this section. Backups can be scheduled or on-demand. To view or edit the configuration backup scheduler’s current settings, an admin-tenant user first navigates to Administration > System > Configuration Backup as shown below. Note: The scheduled backups get stored in /var/lib/avi/backups/ on all Controllers in the cluster. 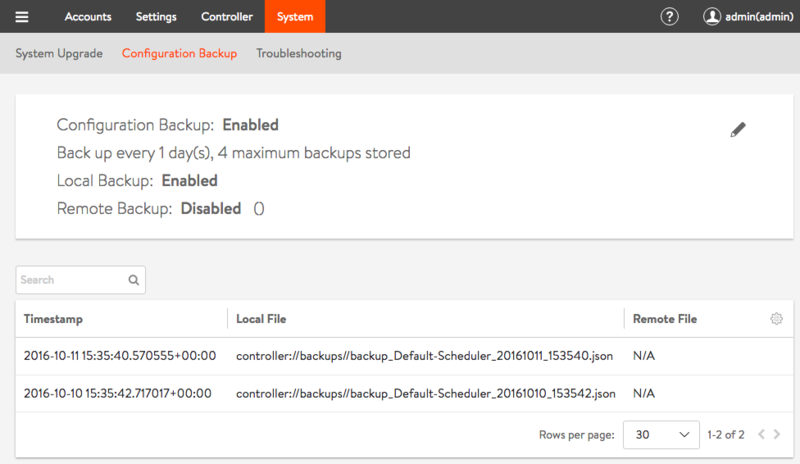 Enable Configuration Backup: Turns scheduled backups on or off. Frequency: A value from 0 to 60 to combine with Frequency Unit to determine how often backups are to be taken. 0 indicates the backup sequence has no end time. Frequency Unit: Backups occur daily by default. Use this field to change the units to minutes, hours, weeks or months. Backup Passphrase: A mandatory phrase that is used to encrypt all sensitive fields contained within the backup. Choose a phrase that is not easy to guess and guard it carefully. Data can’t be restored without it. Local (on Controller): On by default, this switch tells Avi Vantage to preserve the number of indicated backups on the Controller. One can choose the local and remote backup options independently. File Prefix: An optional character string that permits customers to customize the backup archive filename. Number of backups to store: A number ranging from 0 to 20, default is 4. 0 is equivalent to unchecking the Local option. The oldest backup is deleted after the most recent backup successfully completes. Remote Server: This option is off by default. It is recommended that a remote destination be specified in case the Avi Controller cluster fails in a non-recoverable fashion. One can choose the local and remote backup options independently. Turning this option on causes the Controller to log onto the indicated server using SSH user credentials, and then secure copy (scp) the backup data to the indicated directory. Server Address is an FQDN or IP address reachable from the Controller. User Credentials: Use the pulldown menu to select from a previously-defined SSH user or accept the option to create one. Directory: If a target directory other than the SSH user’s home directory is desired, specify an absolute or relative pathname pointing to a directory to which the SSH user has write access. Make sure to replace [CONTROLLER-IP] with the IP address of the Avi Controller (if using a single Avi Controller node), or the IP address of the Avi Controller cluster. If the unlikely should occur and a disaster completely destroys the Avi Controller (or entire cluster), the device/VM hosting the Avi Controller(s) should first be restored to factory default using flushdb.sh. Failure to do so can prevent the Controller from coming up. To restore the Controller to the factory default, run the script /opt/avi/scripts/flushdb.sh. Note: If it exists, the /var/lib/avi/etc/flushdb.done file should be removed before running the flushdb.sh script. Note: If running an Avi Vantage version earlier than 16.2, please contact Avi Networks support for help restoring the configuration. This script imports the backup configuration onto the Avi Controller. If restoring an Avi Controller cluster, this script restores the configuration and also re-adds the other two nodes to the cluster. Create three new Avi Controllers with the same IP address as the original cluster members. (Avi Vantage currently supports only static IP addresses.) At this point, other than having an IP address, each Avi Controller node should be in its factory default state. Log onto one of the Avi Controller node using SSH or SCP. Use the default administrator credentials. CONFIG is the path of the config file. PASSPHRASE is the export configuration passphrase. DO_NOT_FORM_CLUSTER causes cluster formation to be skipped. VIP is the virtual IP of the Controller. FOLLOWER_IP [FOLLOWER_IP ...] is a list of the IP addresses of the followers. The optional --flushdb argument causes the command to delete all configuration before restoring. CLUSTER_UUID is the old cluster UUID to be restored.